I wrote a couple of weeks ago that getting to number one in Amazon’s UK Kindle chart is now more-or-less impossible because the deal of the day always goes to number one. 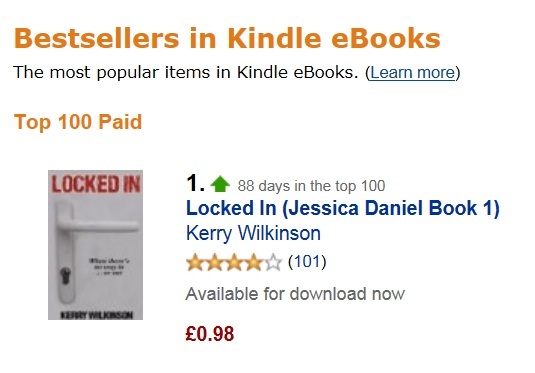 That means I have been at number two or number three – always behind deal of the day titles – for weeks. Today, however, Locked In has returned to the UK No.1 position for the third time. It has also spent over 11 weeks in the top 10, with over three weeks at No.1. Vigilante is at number eight (with three DOTD titles above it) and has spent around 10 weeks in the top 10, while The Woman In Black is at number 18, having peaked at No.15 over the weekend. So I still have all three books in the top 20 overall. Thank you to everyone who has been reading the books and contacting me. I’m still getting some wonderful emails (some shockers too). Meanwhile, a reader in London blogged a review of Locked In, which you can read here.